The best thing to do when pairing pasta with your wine is to ignore the pasta; and its shapes (as you probably guessed) and put more emphasis on the sauce. For example: the wine selection will not be the same if you choose a tomato based dish, as it would be if you chose a rich creamy dish. Similarly, if you choose a seafood pasta dish or a meaty lasagne; so what are the typical recommendations to follow? For rich creamy sauces, perhaps with a lot of cheese, a wine with mouth-watering acidity would match very well, a chardonnay for example; or if you prefer a red wine, you could try a light merlot. However, when adding highly acidic tomatoes in to the mix it’s worth taking a look at the red wine list. When pairing tomatoes, a medium bodied wine such as a Côtes du Rhône Villages would be most suitable, and, it’s worth avoiding tannic reds. 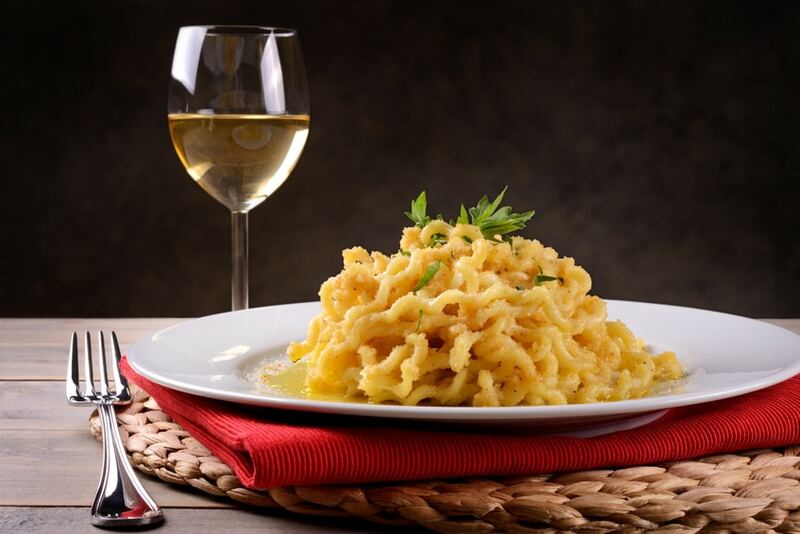 So whether you enjoy a creamy pasta dish topped with large amounts of cheese or prefer a classic tomato sauce pasta dish, taking these tips in to account when pairing your wine will make for great conversations, and frequent wine top-ups. If you want to know more about wine pairing why not book a private wine tour with Planet Provence?